Aphids are small, 1-3mm, soft-bodied insects that can be green, grey, or black. They are a common pest on everlastings all year round, but are commonly seen in spring and autumn on other plants. Aphids can be winged or wingless and are usually slow-moving. Aphids cluster on the tips of the shoots, sucking the sap from the plant, which reduces plant vigour. 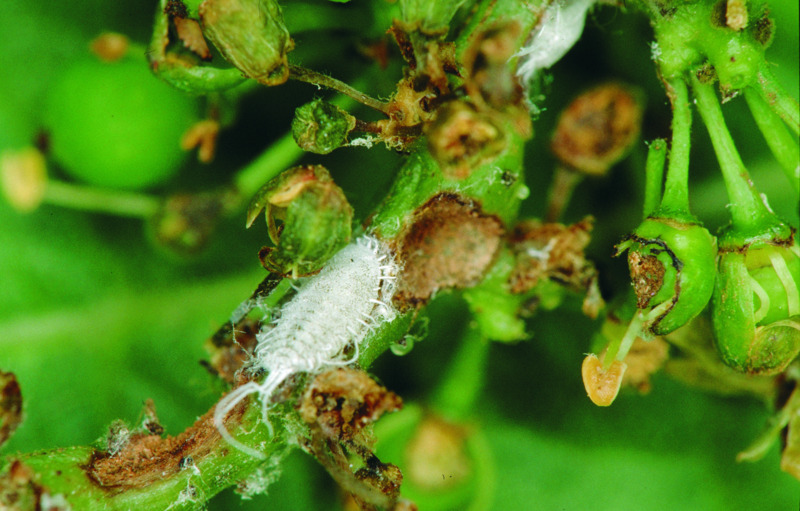 Aphids can also spread viruses which can damage the plant. A number of natural enemies, such as ladybirds and lacewings, will provide biological control if chemical sprays are not used. Soapy water and insecticidal soaps may also reduce numbers or spray with neem, imidacloprid, acetamiprid, garlic extract or pyrethrum. For more detailed information read aphids, mealybugs and scales. Borers are insects, which bore holes into native or exotic plants. A range of insects is involved, mostly beetles and their larvae. They live mainly in living, but generally weakened plants and in bad cases cause death. Groups of borers include beetles, wood moths, weevils and termites. Longicorn beetles range in size from 15-50mm and are a large group that is commonly seen in summer. They have powerful jaws, and are often confused with the European House Borer, which is a quarantine pest in Western Australia. However, European house borer adults are smaller at 8-25mm and have shorter antennae. Healthy plants are normally able to tolerate borer attacks, with new growth outgrowing the weakened branches and exudation of gum restricting borer activity. Affected old branches will break off. Natural enemies of borers are birds, the assassin bug, predacious beetles and parasitic wasps and fungi. Kerosene or soap solution, poured into the tunnels may cause the grub to emerge for destruction. A number of native plants are affected by caterpillars that construct shelters to protect themselves from predators. These caterpillars may be solitary or gregarious and mostly affect plants in autumn. They hide in the shelters during the day and emerge to feed during the night. The shelters may vary from joined adjacent leaves or curling leaves to large solid constructions such as bags or mobile homes. Bag shelter moths, bag moths, case moths, bag worms and leaf rollers belong to these groups. In Western Australia web moths are a common pest on thryptomene and melaleuca. The symptoms are browning leaves and leaﬂess branches and signs are webbing around the leaves. Control the bugs by hand picking, ensuring that the bags are destroyed after removal. Crusader bugs commonly attack wattles and cassias and to a lesser extent eucalyptus, hibiscus and a wide range of exotic plants. They are about 20mm long, most active in summer and cause shoots and ﬂowers to wilt and die. Crusader bugs have a pale yellow cross on their backs when their wings are folded. When disturbed they spray a stinking ﬂuid. If possible control the bugs through hand picking. Many predators control crusader bugs, including birds, spiders, assassin bugs and parasitic wasps.